Korkberget, the big one on the shores of Humaljärvi. The most complex and quite possibly the longest cave in Finland. There are also several smaller side caves, roof caves, and underground crack caves. The book missed the scale of this cave. Main cave's coordinates are N 60.16211° E 24.45271°. There's a map. Högberget, the erosion cave, includes I think several other small boulder caves. One of the side caves was listed in the book. The main cave's coordinates are N 60.106870° E 24.486241°. There's a map and separate article about drawing this map. Gruvböleberget, a roof cave under a cliff in the nice forests between Kvis and Gesterby. Coordinates are N 60.14565063° E 24.48011821°. There's a map. Kasaberget, in Strömsby. The coordinates are N 60.078306° E 24.381000°. There's a map. The Majvik small roof cave. Not listed in the book. The coordinates are N 60.161911° E 24.544294°. There's a map, and a separate article about drawing this map. 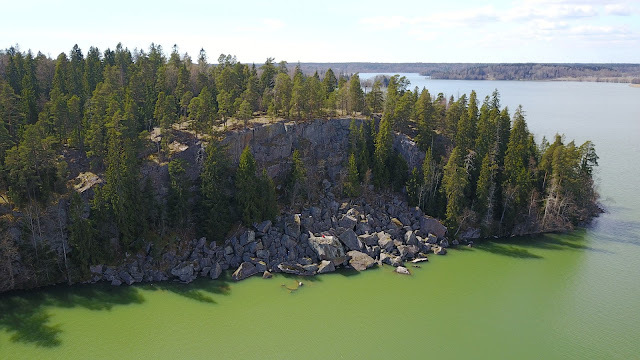 Viinakallio (or the Boose Cliff Cave) in Veikkola. Coordinates: N 60.25240969° E 24.48060409°. There is a map. Vuorenmäen kulkurinluola or the Mountain Hill Nomad's Cave, also in Veikkola. Coordinates: N 60.269348353° E 24.430606378°. There's a map. Kakarberget Cave, yet again in Veikkola, but more of in the middle of nowhere. The nearest place is "Laitamaa" or something like "out-of-center country" in English. Coordinates: N 60.243448028° E 24.496705969°. There's a map. Ormberg, or the Snake Mountain Cave. On a closed military area. Coordinates: N 60.042016737° E 24.364661980°. Skevabackgrotta, that the book lists as unchecked cave in Långstrand lands. The entrance has collapsed, so it is not clear that the cave exists or can be found any more. And there is nothing on the Internet about this cave, a rare occurrence that you can't really find even the word. The approximate coordinates are given as N 60.109438997° E 24.473290786°. Kalasberget small roof cave. Coordinates: N 60.16030955° E 24.46814904°. There is a map. This means that I now have drawn maps of all (reachable) caves in Kirkkonummi! Woohoo!